“Why a legal profession?” Believe it or not, this is just one of the most heart trembling questions to get in acquiring a job interview in a law office. The “why” itself is hard to reason out, how much more with the elaboration of the legal profession with it. Honestly, I, myself asked the same question before. Why would I stress myself out with the legal matters of other people? Why would I go through the hardships of memorizing, familiarizing and studying the depth of laws and its legal procedures? If I were to answer this before working on a law firm, I might think otherwise, and just quit and change my chosen field of study. However, if the question popped up now, my answer would be simple. It is to help others in need while I am educating myself. I believe that this very reason will make me a different, but a better person. The legal profession is not just a career; it is a learning experience. It is the stressful handling of Will Estate that makes it interesting. The drama and a long process of Family Law which provides the challenge. Moreover, the solution making and preparing documents that generate Immigration Law a way for a life and self-discovery. The truth is, this field is hard, confidential and a heavy profession to be into; but what is all these unfavorable scenarios, if you know that at the end of the day, you help. The Bible says, “Love thy neighbor as you love thyself”, and I think helping people through the legal profession is loving them without even knowing them. Will Estate is a big branch of law for it handles the amounts of money and properties of people who want to pass down their assets to their “beneficiaries” at the time of their death. It is interesting because it includes financial matters and assets which sometimes includes commercial law. As someone who loves math and numbers, it engages me to dig deeper on complicated cases which is interesting. Also, it teaches empathy to clients for they experience death which shows respect and support to other people. Furthermore, this type of law gave me a meaning to trust and organization. When a client comes in, and let you see their credit information, it symbolizes trust. Someone in the legal profession will learn how to maintain that trust and be a competent person in their field. The repetitive process of scanning and updating documents which also is a part of being in the legal profession results in patience. Organizational skills are developed because of countless papers to be sorted out but this is useful not just in the office yet also in doing daily chores. So, why the legal profession in Estate? It is because like all the big files in this line of work, you begin to apply the trust, patience, and development of organizing to yourself which are essential to a life with a good future. Family law is a different story. Before, I do not like family law, because I do not get involved with family matters especially divorce. On the other hand, in real legal life situation, there are lots of circumstances that incorporates divorce and through the legal profession I faced my fear. I was like a rat who always runs away from a hungry cat on topics of family matters for I feel swallowed in the situation; because, I am in a failed-relationship family as well. I would not want to see other people to undergo the drama of the process. It is a long process of filing and coping with emotions, although these features brings out the challenge; which is a good opportunity to open yourself out in the positive point of view. Educating myself theoretically with the claiming and process is one thing but listening to client’s background stories while you try to find solution is another. I was challenged because I was elusive on the practice itself though participating in the system made me think different. From a child who has a strictly conservative type of mentality to a lady who is more mature, open-minded and understands the broader issues of family relations. Through this knowledge, I became someone who speaks her mind and expresses herself while family law made me tough. Like a butterfly which finally arouses from its cocoon and comfort zone. Legal profession in Family Law made me understand people but most importantly help myself to take risks to know what I really want. As an immigrant, Immigration law is very close to my heart. During my internship program, this is the most in-demand law in the office because of immigrants who wanted to get their permanent resident cards, citizenship, acquire their properties in their respective country, mostly in the Philippines and renew their work permits here in Canada. I can say that this law is the very core of helping each other. I can really relate to this because I myself, went through all the process they are into, and for this reason, I can learn the sacrifices of OFWs and contribute some advice to them. This legal profession, made me appreciate hard work and passion, not just by Filipinos, but all race to have a better life here in Canada. This law requires filing forms from the immigration and citizenship of Canada to encourage them to grant whatever the client needs. It also requires authentication from the Office of Document Services to Consulates of diverse countries. In the course of my internship period, I saw and felt the joy whenever their application was approved or finished, and it is like a Deja vu for I was thankful as they are when I was on the same situation. Through this, I made a self-discovery and perceive it as a mission to help others considering that it comforts my heart to benefit people from my work. The different stories in our everyday encounter inspired me to be better not just as a person but someone in a legal profession. A constitutionally and lawfully related career is intricate because it makes you firm, competent and consist of a dense work with the law. A lot of people think that this profession is very respectable because of the task that it accomplishes. As a person, the legal profession is not my first love nor was one of the careers that I have imagined to be into yet this experience on the firm and interactions with the different process of each law gave me a different insight and showed me a goal to a legally improved future. 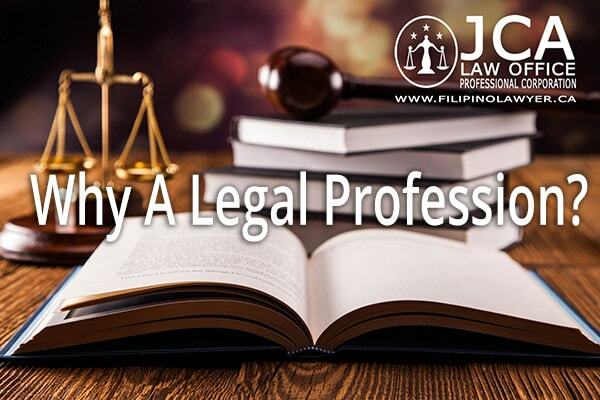 The legal profession can change someone as it changes my personality and even though I may decide to take science and math which are the ones I really love in the long run, I might still consider to be in the legal profession because I saw myself in this career. Therefore, even if I will not end up with a legal profession because of the uncertainties and constant changes of my journey, I can say, I was a vigorous, reliable, mature and legally knowledgeable lady once in my life, and that is something to be proud of.